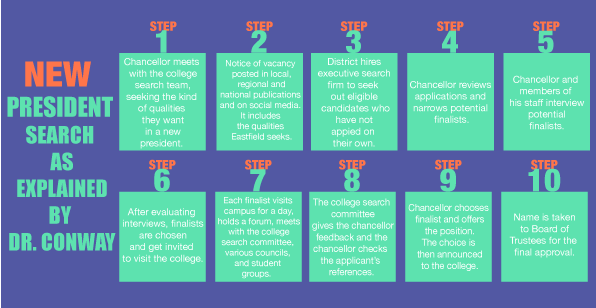 Eastfield was expecting to begin a new academic year with a new president, but due to delays in the search it is uncertain when someone will step in. According to members of the search committee for the new college president, there will be four to six candidates visiting the campus during the first weeks of the semester. President Jean Conway announced her retirement during a Jan. 11 convocation speech. Conway was initially planning to retire by Aug. 31. Due to delays in the search for a new incoming president, the Dallas County Community College District Board of Trustees approved an extension in her contract to Dec. 31. DCCCD Chancellor Joe May continued to receive applications throughout the summer. 2018 semester would have to be extended throughout the summer and early fall. He noted that the extension would allow faculty, staff and students to be involved in the search process since many aren’t available throughout the summer. Executive Vice President Mike Walker said that May wasn’t 100 percent certain with the first pool of candidates. “It’s just going to be hard to find someone to follow someone like Dr. Conway because she’s very special, so he’s just being careful,” Walker said. Walker is also part of the official college search committee. This team is made up of about 20 faculty, staff and community members who were chosen by the district office. Although part of the hiring process, Walker and other members are unaware of the identities of the candidates. Campus visits from potential candidates are tentatively scheduled for Sept. 4-7 and Sept. 10-11. During their visits, candidates would tour the campus, meet professors, staff and student leaders. Also on the agenda are two forums to give as many people as possible a chance to meet the candidates. “Everyone who is a part of Eastfield College is encouraged to come and hear from these candidates to get a sense of who they are,” said Walker. After the forums, May will contact each of the search team members and get their input and input collected from other attendees. May and his staff will check references, make a decision and announce it to the college. Finally, the name will be given to the Board of Trustees for final approval. There is still a lot of uncertainty on how these forums will pan out. History professor Matt Hinckley, a member of the search committee, said they were asked to keep several days of the week open but weren’t affirmed a visit from a candidate. Because these visits will be occurring as the semester begins, Hinckley expects to miss some of the meetings because he will be teaching. Conway said her replacement should be someone who makes the best decisions for the college. Although, Eastfield is a great campus, there is room for improvement. As a professor who was hired by Conway, Hinckley is looking for someone with all of Conway’s qualities. After Conway’s retirement announcement, Hinckley said he realized how much work she had done in her time at Eastfield and although hopeful, he is also worried about the new college president. Hinckley hopes the new college president will keep the current initiatives moving but also bring new ones to help with student retention.